In the last ten years prestigious Open Education Resources projects have been set up, often with generous support from funders. Funders and institutions that support OER want evidence of their use and reuse; it seems, however, that OER have not yet been widely adopted by teachers as part of their daily practice. This paper investigates the use and reuse of OER from a subject-specific repository for language teachers. In particular, the small scale study investigates how and why language teachers use OER in their teaching and rework existing resources. It also examines whether the teachers understand the resources and how to use and adapt them effectively, as an inability to do so has been considered an impediment to their reuse (Dimitriadis et al. (2009), Conole (2010b)). One of the difficulties in working with open resources and open practices is that “the open is the enemy of the knowable” (Beetham, 2011): investigating the adoption of OER and open practices is indeed not without difficulty, and this study proposes a qualitative enquiry based around professional conversations to investigate use and reuse of OER. The research found that, far from not engaging in reuse, the teachers in the study did adapt OER, although most of those changes were not published again. In addition, they drew on considerable professional knowledge when considering the use and reuse of OER for their lessons. The current study suggests that evidence of use and reuse cannot simply be gathered through metrics; some of the reuse and sharing is not necessarily visible, and sharing might not always be appropriate. It is possible that the adoption of more open educational practices will result in reuse and sharing of both resources and practices becoming more visible in the future but, for now, more research is needed to provide evidence of the “invisible” reuse and sharing. Beaven, T. (2013). Use and Reuse of OER: professional conversations with language teachers. 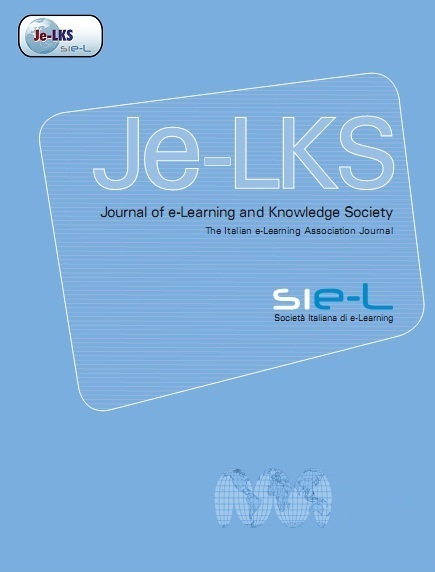 Journal of e-Learning and Knowledge Society, 9 (1), 59-71. Italian e-Learning Association. Retrieved April 19, 2019 from https://www.learntechlib.org/p/43327/. Beetham H. (2011), Impact model Diagram, JISC OER Synthesis and Evaluation project blog, [online], http://oersynthesis.jiscinvolve.org/wp/2011/05/17/impactmodel-diagram/ (Accessed 20 December 2011). Braun V., Clarke V. (2006), Using thematic analysis in psychology, Qualitative Research in Psychology, vol. 3 (2) pp.77-101. Britt M.S., Irwin K.C., Ritchie G. (2001), Professional Conversations and Professional Growth, Journal of Mathematics Teacher Education, vol. 4 (1), pp.29-53. Byskov Lund T. (2010), Engaging users and producers EdReNe report [online], http://edrene.org/results/deliverables/EdReNeD5.4TSR_Engaging_users.pdf (Accessed 1 December 2011). Cohen L, Manion L. (1994), Research methods in education, Routledge Falmer, London. Comas-Quinn A., Beaven T., Pleines C., Pulker H., de los Arcos B. (2011), Languages Open Resources Online (LORO): Fostering a culture of collaboration and sharing, Eurocall review, 18. [online], http://www.eurocall-languages.org/review/18/#loro, (Accessed 15 June 2011). Danielson C. (2009), Talk About Teaching! Leading Professional Conversations, Corwin Press (SAGE), Thousand Oaks, Califormia. Earl L., Timperley H. (2009), Professional Learning Conversations: Challenges in Using Evidence for Improvement, Springer. Eraut M. (1994), Developing Professional Knowledge and Competence, Routledge, Falmer. Lane A., McAndrew P. (2010), Are open educational resources systematic or systemic change agents for teaching practice?, British Journal of Educational Technology, vol. 41 (6) pp.952-962. MIT (2011), 2011 Program Evaluation Findings Summary [online] http://ocw.mit.edu/about/site-statistics/11_Eval_Summary_112311_MITOCW.pdf (Accessed 2 February 2012). Ossiannilsson E., Creelman A. (2012), From proprietary to personalized higher education-how OER takes universities outside the comfort zone, Journal of e-Learning and Knowledge Society, V.8, N.1, 9-22. ISSN: 1826-6223, e-ISSN:19718829. Polanyi M. (1958), Personal Knowledge: Towards a Post-Critical Philosophy, London, Routledge.